So wonderful that I generally have to avoid them. Like that one night sophomore year of college where I bought a bag of kettle sea salt and vinegar chips to have as a little salty snack at night for the WEEK. 3 hours later, the bag was gone. In my defense, so much of the bag is air and there were maybe only 6 servings in the bag. But still. It’s generally what happens to me. Don’t get me wrong – I love snacks though. I’ve taken to making a bowl of popcorn almost nightly as a post dinner snack. My roommates have this wonderful whirl popcorn machine where you just have to add kernels and a little bit of vegetable oil and then after 5 minutes or less you have freshly popped popcorn! Anyway, I’ve been snacking on that a lot but I’ve been trying to come up with recipes that make simple, pretty healthy and unprocessed snacks that have some weight to them. That’s when I thought up these bad boys. 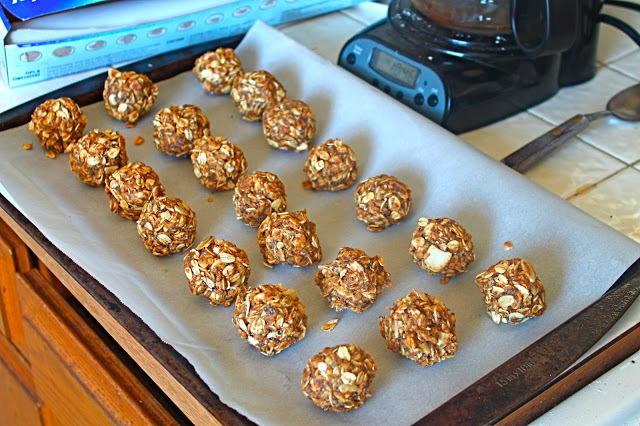 Instead of making granola bars, I decided to make them into bite size balls and they’re delicious. You get some great nutrients from the flax and the chia seeds, some sweetness from the honey, and a great peanut butter from the, well, peanut butter. These have crazy awesome textures going on too between all the ingredients. I made these for me and my friends to snack on during the road trip to and from Vegas and at the hotel as well. Over the course of the weekend, we ate all of them and they were an all around hit! 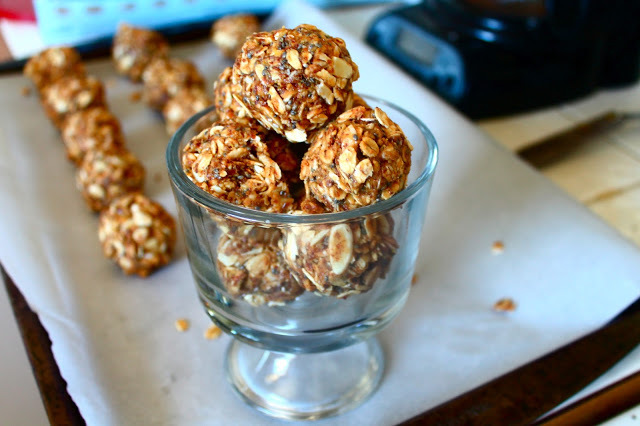 I’ll definitely be making these again to have as a healthy snack that doesn’t compel me to also eat an entire batch. Win-win situation right? 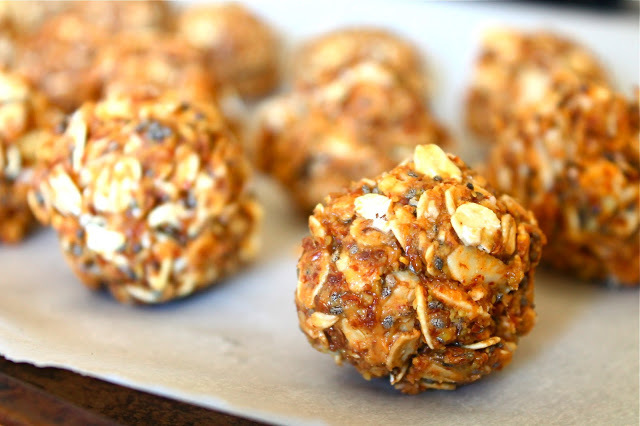 In a large mixing bowl, stir together oats, ground flax seed, chia seeds, and almonds. Set aside. In a small microwave-safe bowl, add the peanut butter and microwave for 20 second intervals, stirring in between, until peanut butter is smooth and melty. Pour both the peanut butter and the honey over the dry ingredients, mixing until the whole mixture starts to stick together. Wet your hands and roll the mixture into small balls. Keep wetting your hands as needed (the mixture will start to stick to your hands). Store these in an airtight container at room temperature or in the refrigerator. P.S. This is my 50th post here on the blog – crazy! Would you like to follow each other on bloglovin and GFC!! !